Something went wrong with these big robots and they started to demolish everything around. Use your slingshot to damage hidden and important reactor of the robot! It's time to show everyone your courage and desire to help! Brute force is not working against armored robots. You have to find the way to stop them. But wait a minute, your old slingshot is the only thing you have. The good news you are the best shooter in all neighborhood. Prove other citizens you can hit whatever you want. 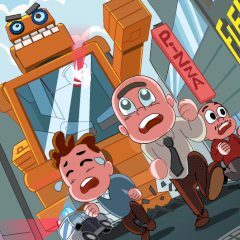 Detroy robots' power supplier and save this city from destruction.